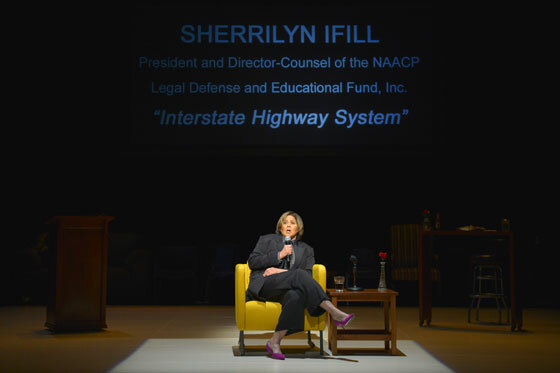 Anna Deavere Smith’s “Prison Pipeline” Play: Brilliant, Yet Conflicted. Anna Deavere Smith’s “Notes From the Field: Doing Time in Education,” is more than a play. Part documentary, part drama, it encourages audience members to become activists against the “school-to-prison pipeline,” which connects our failed education system with the prison-industrial complex. The show’s program also contains a “toolkit” which describes the racial inequity of zero tolerance school discipline policies and presents alternative methods such as the restorative justice program currently in place in the Oakland Unified School District and other proactive behavioral approaches which address the reality of post-traumatic stress syndrome among school-age children. But the show doesn’t stop there. It devotes its intermission to interactively engaging attendees in advocacy, with Youth Speaks-trained facilitators pushing small workshop groups to make a commitment to action (more on this later). 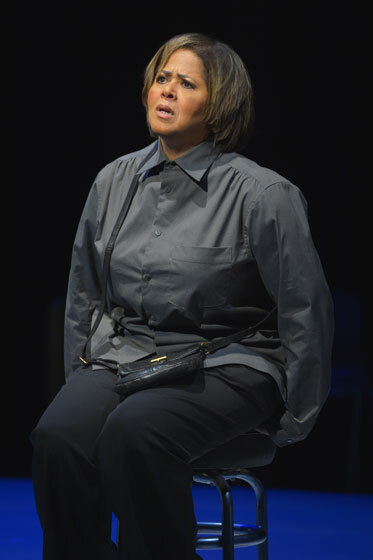 The first part of the show effectively reveals why Deavere Smith’s one-woman shows have won many prestigious awards: her methodology, which involved interviewing 150 people on both sides of the pipeline, then honing their verbatim accounts into character studies and ultimately, monologues, is absolutely brilliant. This approach one-ups the “one-woman, many characters” style of Sarah Jones by using non-fictional source material, which is technically much more difficult to pull off. Deavere Smith uses simple stage props, varying speech patterns, and gesticulations to bring each character to life, with vocal inflections which range from the crisp articulation of a multi-degree holder, to the guttersnipe syntax of a high school dropout. The vignettes, which feature education professionals, judges, lawyers, parents, students, and chronic truants (who have become fodder for the prison system), connect thematically, presenting a multi-faceted inquiry from almost all sides of the paradigm – we don’t specifically hear from any law enforcement professionals or correctional facility employees – and segue with musical help from acoustic bassist Marcus Shelby, who provides jazzy textures throughout. In addition to supertitles identifying each interviewee, video clips which play on screens above the stage add further context. There is both a sense of urgency and topical relevancy, especially when Deavere Smith recounts the stories of the videographer who filmed Freddie Gray’s arrest and a man charged with a $500,000 bail for protesting Gray’s death. Another story, of a Native American man who was never enfranchised by public education and becomes a violent ex-con who is now a concern for tribal authorities, resonates with poignancy. Though there are numerous comic moments, laughing at them felt a little awkward, since the overall tone is so serious. “Notes From the Field” is ambitious in its reach, to be sure. But these types of problems can’t be solved in a couple hours. The intermission workshop felt a little like drop-in activism for a constituency which has not had to deal personally with any of these issues, such as having an incarcerated family member, or being racially-profiled by police, in their lifetimes. It’s counter-intuitive, to say the least, to announce — with all the pomp and circumstance of a critically-acclaimed theater performance — that the system is broken, while simultaneously helping to promote a company complicit in the economic exploitation end of the pipeline. The reality is a little bit thornier: Whole Foods, who has recently been all over the Internets for utilizing prison labor, is listed as a sponsor of the production. However, when Whole Foods’ connection to prison labor was pointed out in one of the workshops, one attendee reacted with an angry glare and sputtering disbelief, and the workshop’s facilitator seemed to have difficulty grasping the implications of what that meant. It’s counter-intuitive, to say the least, to announce — with all the pomp and circumstance of a critically-acclaimed theater performance — that the system is broken, while simultaneously helping to promote a company complicit in the economic exploitation end of the pipeline. That may not be the fault of Deavere Smith, but it does illuminate the inherent conflicts of even doing a production of this nature. If we’re going to go there, identify the problem in no uncertain terms, and break the fourth wall to demand action be taken, as “Notes From the Field” does, we’ve got to be willing to address how deep the issue really goes, and realize that effecting substantive and meaningful change might just be incompatible with doing business as usual. If we were to further nitpick, we’d point out that another of Berkeley Rep’s sponsors, Wells Fargo, owns Wachovia, which was investigated and fined by the Justice Department for laundering money for Mexican drug cartels – whose influx of illegal narcotics is reportedly a causal factor in the hundreds of annual murders in Chicago, mostly of young black men. Even worse, Wells Fargo also has invested tens of millions of dollars in private prisons , making it complicit in economic exploitation, sexual and physical assault, denial of health services, and racially-disproportionate practices. Again, this kind of disingenuousness undercuts Deavere Smith’s message, through no fault of the messenger. That’s not the exact quote Deavere Smith used, which came from a seven-hour conversation with Margaret Mead called “A Rap on Race,” but in this context it suggests that until we fix our fractured education system and retool our discombobulate criminal justice system, we will not, and cannot, possibly evolve into a “post-racial” society, no matter how many Confederate flags are torn from F-150 trucks. It’s fitting that “Notes from the Field” is being presented just a few miles from Oakland, the spiritual center of the “New Civil Rights Movement” that #BLM has been called. 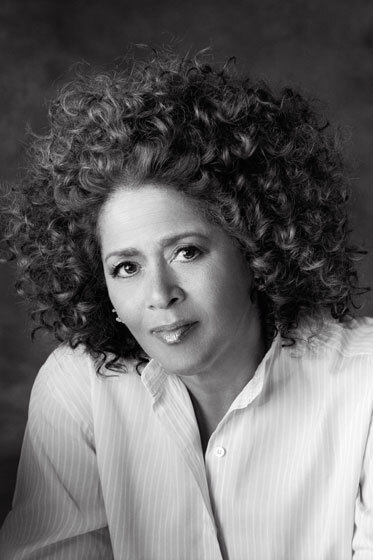 In one of the interviews, Deavere Smith recounts how a teacher thought she missed the boat on civil rights activism by being born at the wrong time, until she realized that a new movement could happen at any moment. That statement apparently resonated with a silver-haired white woman seated one row up, who felt compelled to comment to Oakulture about it – seeking the approval of one of the few black men in the room, perhaps. But only time will tell whether that woman is willing to forgo prison-farmed organic tilapia and artisanal cheeses, for the movement’s sake – or whether a war on bankers would yield better results than the war on drugs. “Notes From the Field: Doing Time in Education” runs through August 2 at Berkeley Rep. For tickets, visit here or call 510-647-2949. Categories: Theater Review | Tags: #blacklivesmatter, Anna Deavere Smith, Berkeley Rep, Marcus Shelby, Notes From the Field: Doing Time in Education, Oakland, Prison-Industrial Complex, private prisons, restorative justice, school-to-prison pipeline, Wachovia, Wells Fargo, West Baltimore | Permalink.